You know a place is serious about birds—and about attracting birders—when it publishes its own bird checklist. So it is with Tri-County State Park in Bartlett, which I visited for the first time on Sept. 4. I’m embarrassed that it took me so long to get there. The 500-acre preserve—parts of which are in Cook, DuPage and Kane Counties—opened to the public in April 2003. Since then I’d heard good things about Tri-County, including some very promising bird reports. One that stands out is a field trip last April when birders spotted more than 50 Wilson’s snipe. Talk about a successful snipe hunt! Tri-County is unique for being a joint venture between the Forest Preserve District of DuPage County and the Illinois Department of Natural Resources. The Forest Preserve District manages the park and conducts environmental education programs on the grounds and in the impressive new visitor center. Kevin Luby, one of several naturalists on staff, is Tri-County’s resident bird expert. He told me that nearly 100 species have been seen at the park since record keeping began in June 2003. Notable species sighted this year include bald eagle, osprey, sandhill crane, northern shrike, orchard oriole, yellow-headed blackbird, sedge wren and dickcissel. Among the park’s known breeding birds are wood duck, American woodcock, sora rail and Wilson’s snipe. In August, birders discovered a common moorhen with four chicks in the wetland just north of the Indigo Trail loop—an excellent find for this area. A couple of those chicks were seen again when I toured Tri-County with the DuPage Birding Club. I was not among the lucky observers, but it was still a great morning. A highlight for me was learning the gurgling song of the marsh wren and then enjoying great looks of the bird at close range. As a birding venue, Tri-County is very good and will only get better. The park offers five miles of easy-to-walk trails that showcase a nice variety of avian habitats. Native prairie and wetland restoration projects on the former farm fields will produce great benefits for migrating and breeding birds in the coming years. Displays in the visitor center explain the remarkable transformation that is taking place due to the Forest Preserve District’s efforts. Currently, Luby says, most of Tri-County’s birds are seen in the marsh areas or in shrubby patches along Brewster Creek. For birders who want the “most bang for their buck,” he recommends the short Indigo Trail. He also likes the bridge between the Indigo and Bluestem Trails for spotting warblers and vireos in the spring. Pick up a map (and a bird list) at the visitor center. Luby will lead bird walks beginning at 8:30 a.m. on Oct. 12 and Nov. 9. The walks are free but advance sign-up is required—call (847) 429-4670. The entrance to Tri-County is on the north side of Stearns Road, west of Route 59. It happened again. On August 20, a bird made my day. When I least expected it, smack in the dog days of summer, a Carolina wren visited my yard. A first! And like it so often does in birding, luck played a big role. The lucky part is that I happened to be outside. It was one of those unseasonably cool days last month so I took my coffee and newspaper out on the patio. I was keeping an eye on our bird feeders, of course, but not expecting anything unusual. Then I heard it—a strikingly loud and distinctive song. I knew instantly that I’d never heard it before, at least not in the backyard. I really should have recognized that sound. I’ve seen and heard Carolina wrens many times while vacationing in South Carolina, where it’s the state bird. But on my patio that morning I guess I was too surprised to think. I needed to see the singer. Fortunately, after an agonizing minute or two, the wren popped into view. When the bird moved on—it never went near my feeders—I went inside and grabbed my “Birding by Ear” CDs. I wanted to hear that song again. That’s when I learned something interesting. The narrator said that the Carolina wren is one of the few birds that sing year-round. Come to think of it, it did seem odd to hear a bird singing like that in mid-August. Later I looked in a few books to find out more. Carolina wrens are not migratory, which I didn’t know, and the Chicago area is about as far north as they ever go. Like mockingbirds, another “southern” species, they are said to be turning up in DuPage County with increasing regularity. Seeing the wren was a great surprise, and learning some facts about it made the experience even better. Lately I’ve been reminded how much more there is to learn about birds, even the common ones. A few weeks ago I was reading “Two Blue Jays” to my 3-year-old son. From that children’s book I discovered that the blue jay is the only bird that will bury nuts and seeds in the ground and come back to them later. I knew jays were clever but I didn’t know that. Then last month I went online to check out Laura Erickson’s monthly birding column in the Minneapolis Star Tribune. She wrote that cedar waxwings, when building their nests, sometimes steal building materials from the nests of their neighbors. This information took my opinion of waxwings down a notch, but I still think they are the best-dressed birds on the block. We can all enjoy birds just by looking at them, and sometimes that’s enough. But learning about their habits and lifestyles can help us appreciate them even more. As birders, it’s always rewarding when we take the time to be curious. Copyright 2004 by Jeff Reiter. All Rights Reserved. One of my goals for this column is to share resources that can make birdwatching even more enjoyable. I’ve written about our local birding clubs, for example, and I’ve recommended some good books and useful Web sites. This time I’d like to tell you about an online community known as IBET, which stands for Illinois Birders Exchanging Thoughts. The name is a little misleading—IBET is not some sort of intellectual think tank for birders. Yes, thoughts are exchanged, but the network is mostly used for reporting local bird sightings. 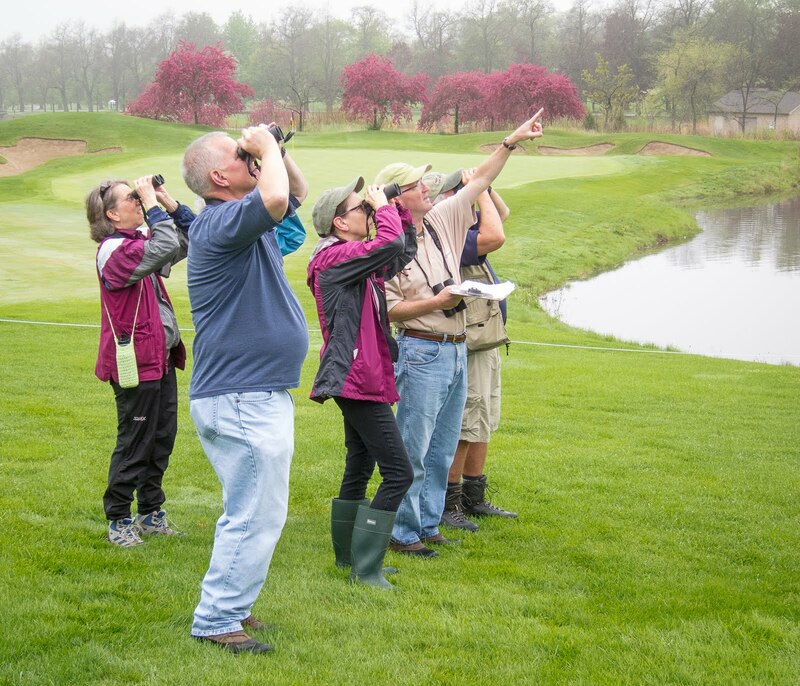 The “what, when and where” is valuable information for birders who want to see more species, including the truly rare ones that occasionally visit the Chicago area. As of mid-August, IBET had 588 registered members according to Sue Friscia, a birder from Alsip who founded the list-serve in 1985. Her motivation? “I was obsessed with knowing what everyone else was seeing and didn’t want to miss anything,” she says. Devoted IBET users don’t miss much, that’s for sure. News travels quickly on the network, often leading to spur-of-the-moment birding opportunities that are too good to pass up. A few years ago I was in my downtown Chicago office when I noticed a fresh IBET posting about a least bittern at North Pond in Lincoln Park. The secretive marsh-dwelling species had been spotted about an hour earlier. What the heck, I decided, it’s Friday afternoon. So I grabbed my binoculars and dashed out the door to catch a northbound bus. I was on the scene 20 minutes later and, fortunately, so was the bird—in plain view, perched on a low branch just above the water. It was the first least bittern I’d ever seen, and IBET made it possible. The number of daily messages posted to IBET varies greatly by season. During the peak of spring and fall migration, when waves of non-resident birds are moving through the region, the network may receive 40 or 50 postings a day. That’s information overload for many of us. But if you read just a fraction of the messages you’ll get a good sense of what birds to watch for at different times throughout the year—and even what to expect in your backyard tomorrow.